Once Betal joked, "Vikram, I think you need a flying machine to catch me." Saying this he began narrating a story about a flying machine. A girl called Chandraprabha had decided to marry a great scholar, a warrior, or an inventor. Her family began searching for grooms to fit her choice. Her father met warrior who had won many medals for his show of courage. Impresed, he promised to marry his daughter to the warrior. At the same time, her brother met a brilliant scholar and her mother an inventor, and both offered Chandraprabha's hand. One day, all the three suitors decided to meet Chandraprabha. While the warrior and the scholar came walking, the inventor flew down in his newly made flying machine. An argument started among the father, the brother, and the mother as to which man among the three was the best. Suddenly, they heard loud screams and rushed to see what had happened. 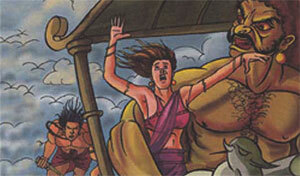 They found a huge demon speeding away with Chandraprabha on the flying machine. While Chandraprabha's parents panicked, the scholar and inventor stood watching helplessly. The warrior attacked the demon with his sword and saved her. Now Chandraprabha wondered which suitor to choose. So Betal asked Vikram, "Which man did chandraprabha finally marry?" Vikram said, "The warrior, because he risked his life to save her while the other two did nothing ." Hearing the answer, Betal flew away like the flying machine.